From Raccupine Farms: Eating what’s “hot” when it’s hot! A few recommendations first. If you are going to use kale and collards I recommend removing stems from kale and collards and using them in cooking or for making a stock or tea. Also, my experience with green smoothies is that they will rarely come out with a milkshake consistency. The good news is, I've been told, that having to chew a few small nuggets in your smoothie is excellent for your digestion because chewing triggers digestive juices that will better process the nutrients you are ingesting. My disclaimer: I am not an expert on smoothies. I experimented and made this one up to be palatable for me. The first ones I tried from the internet were pretty bad. They were too watery for me and tasted just WAY too green. You'll know what I mean when you taste mine. It's green as all heck but it contains lots of ungreen flavoring. I don't like the brown color that beet greens bring to it (red & green = brown) so I tend to ignore those. Let's go! Into the blender I pour 2 - 3 cups of spring water, add a small clove of garlic (don't overdo it! ), and a teaspoon of bee pollen. When I know I am going to use collards, in particular, I also add about 1/2 cup of grapefruit juice or two hefty starfruit that will counteract any bitterness from the collards. 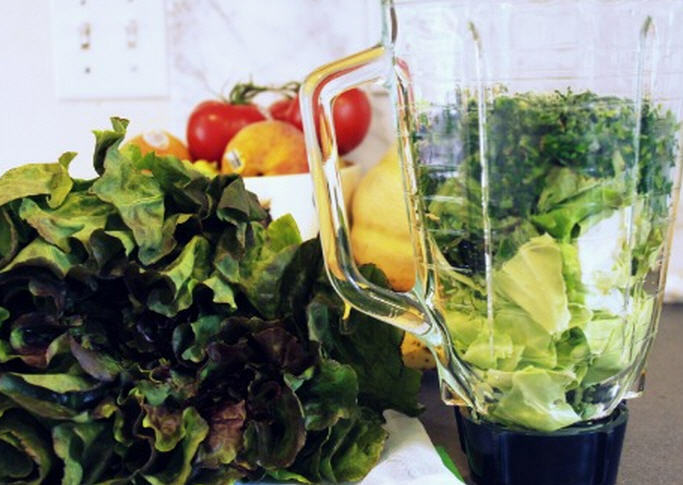 I blend that up on medium speed and then start adding my greens on high speed (whatever you use to crush ice - LOL). I literally keep stuffing my greens in through the whole in the blender cover. In they go, (approximate portions) two large collards leaves with stems removed, a bunch of kale with stems removed, and maybe a small bunch of swiss chard. Other times, I use a whole head of bok choy (like I would add celery if we grew it) and then a little swiss chard. Once the greens are well blended, I like to throw in just a bit of cilantro. I add a few tablespoons of organic peanut butter and a few small frozen bananas and blend until the machine goes back to purring. It's important not to over blend the last two ingredients because you don't want the bananas to warm up from all that mixing. This chilly smoothie fills my blender and I drink the entire thing--straight from the blender--which takes at least half my morning. So what are your smoothie recommendations?